German manufacturer of vacuum pumps, Leybold, is presenting its latest products this week at the Analytica trade fair in Munich. On show is vacuum technology for use in the laboratory, in analytics and biotechnology. Products include the compact SOGEVAC NEO D, the new oil-free SCROLLVAC backing pump, the ECODRY, and the new TURBO.CONTROL i controller. 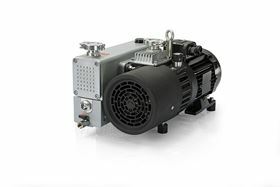 The new two-stage SogevaC Neo D rotary vane pump is equipped with a high-quality exhaust filter inside the oil casing. Built-in filtration reduces the required integration volume of the pump and ensures a clean environment without oil smoke or loss while pumping down. The Scrollvac series offers low power consumption and high pumping speed. The hermetic sealing of the rotating parts from the pump chamber reduces the risk of contamination and by dispensing with shaft seals, which are susceptible to wear, a higher degree of tightness has been achieved. The Ecodry plus is a clean, compact pump in the size class 40 to 60 m3/h, developed to meet the requirements in analytical or research laboratories. It has been developed according to the requirements of systems such as mass spectrometers and electron microscopes. The Turbo.Control i controls and monitors the turbo molecular pump product line Turbovac I(X) and is suitable for use in high vacuum applications and integration into compact system solutions. It can be operated precisely via the display and the front keys or via the pre-installed web server interface. The Leybold team are at stand 319 in In Hall B1.